Tomorrow, I'll be traveling up to Saint Anselm College in New Hampshire to participate on a panel about the evolving role of social media in political campaigns. The panel is called "Click, Blog, Post, Tweet… VOTE: Social Media and the Contemporary Campaign," and will focus on the specific tactics and experiences the panelists have had with social media in political campaigns. Joining me on the panel will be Blue State Digital's Social Media Director Ryan Davis and i3 Strategies founder Julielyn Gibbons, and our moderator will be Patrick Griffin, the CEO of Griffin York & Krause. The flattening of the social web. As evidenced by F8, social media is becoming more tightly integrated into outside websites and applications, making the social web flatter. You no longer need to actually be on Facebook to know if your friends like or recommend a brand/candidate. This development makes your social presence all that more important. A candidate's role in social media. There's always great debate about if a candidate should be tweeting for themselves or not. I'm fiercely in support of candidates having some responsibility for their social media accounts -- I think it makes those accounts more interesting, fun, and relatable. However, I'm also aware that it's not feasible for it to fall 100% on the candidates' shoulders. A balance is necessary, but it's just due to the resources and strategy it takes to manage the accounts not because I worry that a candidate can't handle it. Anthony Weiner had a personal problem, not a Twitter problem. Global impact. No doubt something we'll focus on is the role of social media and the Arab Spring. This topic will be an interesting one, and I'm looking forward to hearing the views from fellow panelists. No hiding from social. Above all, I think it's important to stress that you can't hide from social media, even if you don't participate. One of the most secret missions in history was live tweeted by an IT guy in Abbottabad, Pakistan. Whether a candidate or staffer is on the campaign trail or at a party, your actions can have huge ripples due to social media. Don't be afraid. I think this topic always has an undertone of fear associated with it. Consultants are afraid their clients will go off message. Candidates fear that they can't handle the technology. And voters are afraid of candidates invading their personal space. At the end of the day, the space is still evolving, and I think it's essential that you're willing to try out new things and not be afraid of making a mistake. No campaign is perfect in any medium. Thanks again to Sant Anselm and NHIOP for hosting this event, it promises to be a good one. Hope to see some familiar faces there, otherwise, keep an eye on my Twitter feed for the URL where they'll be livestreaming the event. If you have any recommendations for other things I should talk about, leave them in the comments or direct them to @newmediaclay on Twitter. To see more of my thoughts on the topic, check out this "oldie but goodie" from our blog - Social Media in Political Campaigns. UPDATE: Below is the video from the panel which was just posted by the great folks at Live Free or Die Alliance. 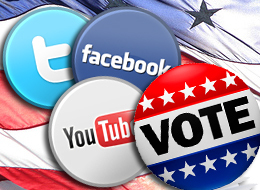 Click, Blog, Post, Tweet ... VOTE: Social Media and the Contemporary Campaign from NHLFDA on Vimeo.